i found some soft stuff ... hah! the female human left the drawer open where she selfishly hoards some soft, silky stuff i hardly ever get to take a nap on. she left the computer turned on, so i'm writing the "blog" today, too. she's running all over the place because something bad happened to the scary, fast metal thing that takes me to the vet. she is upset about this. it's in a place called "the shop," and she has to go "downtown" and she needs to go see somebody called "adjuster." She also has to go to someplace called "bank." there's a different fast metal thing in the driveway. i can see it from the kitchen window. i wonder if she's trying to trick me into going to the vet again. right now she's talking to the black plastic thing that lives on the wall -- it has a loud, unpleasant voice and it goes off with no warning whatsoever, frequently disturbing my sleep. she's making mad-faces because the person who mashed her scary metal thing didn't have something called "insurance." it seems that they lied about this when the metal thing got hurt. wait a second ... she's putting those leather things on her feet ... and she has that ring full of shiny, dangly things ... and she picked up the bag she keeps "money" in. i can stay in the soft place for a nice long while. I hope she remembers to get more of that mushy chicken-flavor food. she also told the male human, "we have to go and vote." it sounds pretty important, and i know she's always carrrying on about how humans who don't do it have no right to complain after "election day." so you better go and vote too. Bummer! In NM, we pay a huge amount of our insurance for "uninsured drivers." I am in fear of getting mashed my one of those. 'Cause it takes away from the yarn money. Oh Dez - I'm sorry. Shamu didn't metion you having any new wrappings or decorations on your body, so I'm guessing you're OK.
My Squeek is too big to fit in my soft silky storage place. Yes, I'm hoping everyone is alright. Shamu, I think the person who lied about "insurance" should have to go to the "vet" for a "procedure". "Vote" is a big word in our house, too - heading to the polls with Katrina, among other things, firmly in mind. hope you are ok! So sad about your accident. please let us know how it goes! Dez is fine, collision was minor and happened a little while ago. Nitwit who lied about insurance doesn't know how to drive, either. Shamu has a "twin cousin" who lives here at my house on Maui. Should say "is lord at my house on Maui." If I had a blog, Tucker would be writing on it, also. My you are not only a gorgeous cat but very clever too.Your Mum is quite right if you don't vote you live in danger of a dictatorship.As for her genius use of your litter boxes tell her I use Hoummous tubs, Take-out plastic boxes, along with some I buy. You look so snug I think it's time to turn in. Tickling your ears. Hey Shamu, Tasha and Muffy and Sophie here, in Ireland. We really really didn't know you had those nasty shiny metal things to take you to the vet over there too. We thought it was only us small dogs had to go here in Ireland and we wanted to emigrate to Louisiana. 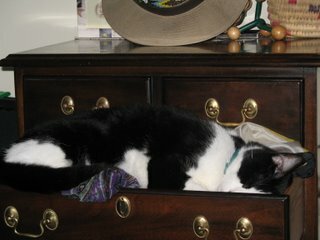 Still might - any room in that drawer? We can bring some of Herself's silky special yarn if you like - she thinks we don't know where she keeps it, but we DO!